Kumho Ecsta SPT tires are designed as ultra high performance tires with a directional tread pattern that give you the ultimate in handling on dry or wet roads. The thing you will immediately notice from these tires is their stickiness around corners. They handle well, yet the tread wears very good as well. The aggressive tread design is computer enhanced and includes features like Three dimensional lateral grooves and unique High Dispersion Silica in the tread compound to not only evacuate more water away from the tire, but also give it better overall performance on rain soaked highways. This Kumho tire also features a rotation wear indicator that lets you know in an instant when it’s time to rotate your tires for optimal wear and longevity. They’ve also added a rim protector in the sidewall of the tire to prevent damage to the tire from curbs and other obstacles. The tire itself has twin steel belts with a jointless nylon cap to strengthen the tire and give it better stability at higher speeds. Prices on the Kumho SPT range from around $90 for the 16 inch series to upwards of approximately $290 for the massive 295/25ZR22 model. Who Are Kumho Ecsta SPT Tires Designed For? Kumho has designed the Ecsta SPT tires for all sport coupes and sedans among other types of vehicles, for drivers looking for high performance on wet or dry pavement to go along with a comfortable ride. 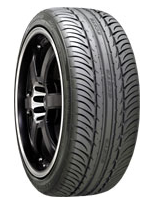 The warranty on the Kumho Ecsta SPT does not include a tread wear guarantee. They do however have a one year or first 2/32 inch of wear on the tire’s uniformity. You will also find a 6-year guarantee on materials and workmanship that includes a free tire replacement during the first 2/32 inch of tread wear, followed by a prorated amount for the remaining time period until there is only 2/32 inch of useable tread left. Kumho tires also has a road hazard warranty for the first 25% of wear on the tread depth as well.